Crispus, his laureate and cuirassed bust left. Two victories facing, placing shield enscribed VOT PR on altar. Minted at officina A in Siscia (Sisak, Croatia) in 318 or 319 A.D.
Bruun, P.M., "Roman Imperial Coinage", Volume 7 (RIC), Siscia, p432, nr. 57, unlisted variation from officina A.
Sear, D.R., "Roman Coins and their Values" (RCV 4th Revised Edition), p330, nr 3926, variation from the Siscia mint. 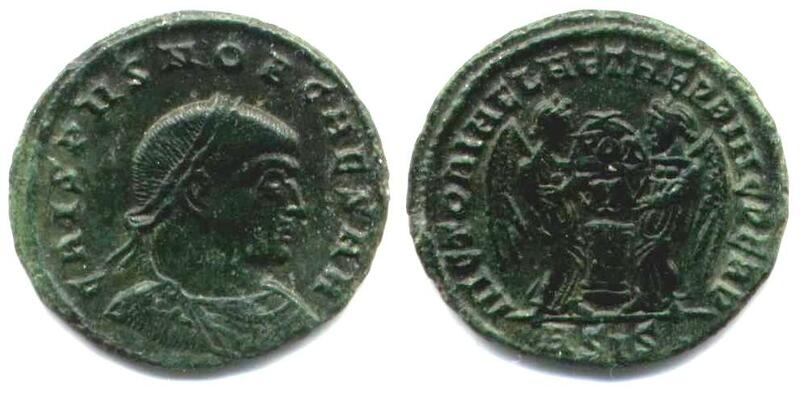 Van Meter, D., "Handbook of Roman Imperial Coins", p294, nr 23, variation with unlisted obverse legend.